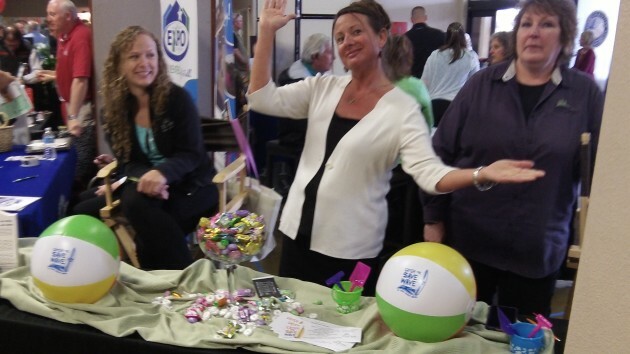 Rebecca Grizzle strikes a pose at the booth of the Linn-Co Federal Credit Union during the Lebanon Business Expo today. About 130 mid-valley businesses and countless visitors crowded into The River Center, and the size of this annual networking event impressed me and — like Grizzle’s enthusiasm — may indicate the heightened vitality of Linn County’s second largest town. Not everything is rosy. The city council, of which Grizzle is a member, just had to lay off 10 city workers because a previous administration had worked the city into a budget hole, and drastic measures were required to dig out of it. A new city administrator has been hired and started work, and the fiscal emergency is not likely to recur. Meanwhile, this town of about 16,000 looks pretty good in the pale sunlight of an April Tuesday. There’s plenty of traffic on Main Street (Highway 20). Most of the storefronts seem to be filled, even if many are second-hand shops. The sales lot of a former auto dealership (I bought a truck there once) has sprouted a coffee joint even though the car store is still vacant and for sale. 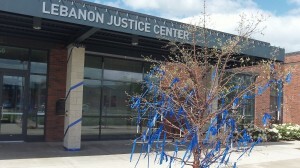 On the campus of Lebanon’s growing medical school, the buildings including the student apartments look new and bright. The campus along with the new fitness center of Samaritan Health Services, and the hospital across the street, are tangible signs of the town’s effort to make itself a focus of medical education in western Oregon. Lebanon used an aggressive urban renewal program to pull itself out of the doldrums in which it languished when its history as a mill town came to a grinding halt in the period after the 1980s. It used the program to build streets and extend utilities to vacant lands, areas now occupied by the medical school and Lowe’s huge distribution center and other industries. Yet Linn County’s unemployment rate is 8.4%, I suspect Lebannon’s is similar. The handsome buildings cost taxpayers a lot of money….money they may not feel they can let go from their own budgets.